One of the largest parts of today’s fashion and trends is dealt with dresses. This is why people are being more conscious about their dress. But until a couple of years, people had to choose their clothes from the collection of a display. But recently, with a huge development of web system, people can customize their dresses as they want. To plan for a t-shirt eCommerce shop, you have to be aware of some essential facts. like SEO, WooCommerce, drag and drop page builders, enough layouts, sidebars, portfolio etc different header etc. are the main facts you have to know about. It is also essential to know about their functions and features. However, I am trying to give a legitimate and authentic description of the functions and facilities of the following themes. I hope you will get the best theme for your shop, which will be the perfect one for you. In advance, I am wishing you all the best. To provide t-shirt of people’s desirable print, you must have a tshirt eCommerce WordPress theme. I am presenting Teepro for you. 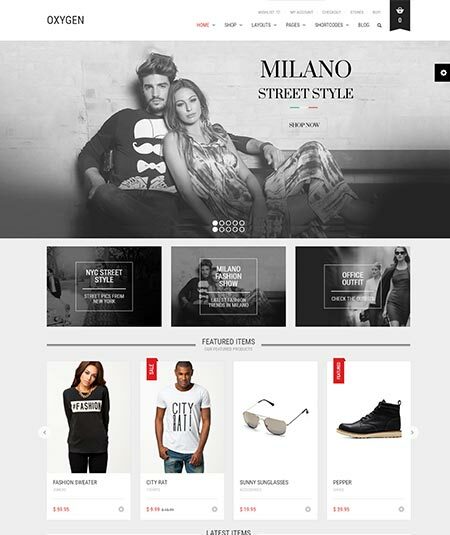 It is actually a fully responsive and well-featured t-shirt design WordPress theme. Teepro will provide you with tons of demo features. These will help you to operate the theme easily even if you are a beginner. It is also very easy to use and customize and even install. As Teepro is an SEO friendly theme, it will always ensure you about your themes ranking. It is also fully responsive with WooCommerce capability. So you can easily get profit by selling your products. With tons of color options and Google fonts, you will get it very easy to customize and decorate your theme. So I think Teepro has almost all the qualifications to be one of your wise choices. 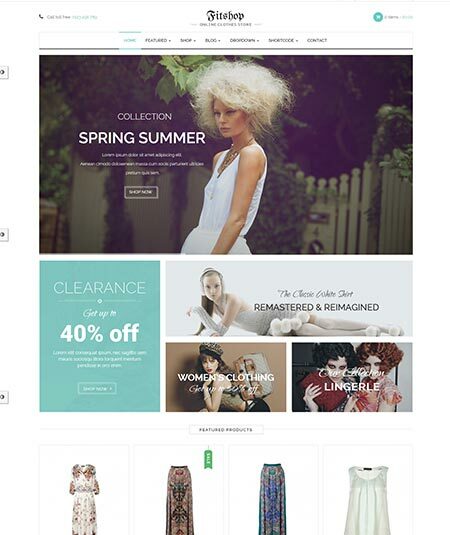 Glory is a multi-purpose WordPress which is specially designed as an online fashion store. Glory has all the desirable functions that a smart businessman want to have. Let me tell you something about it. First of all, Glory is WooCommerce supported. So it will be very easy for you to get benefitted by selling your fashion items through the online markets. As a good online store, it has to belong this WooCommerce support. Glory is designed in such a way, that you can also use it as decoration, interior or furniture store. This dynamic theme also includes the mega menu theme and a powerful admin panel. 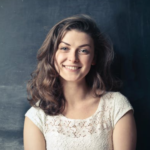 To add something about you or the owner, you will have the portfolio option too. It also includes about 15 different widgets that let you insert the content quickly. So what’s wrong with this 100% responsive theme? If there is not at all, go, grab it soon. Do you ever meet Sober? 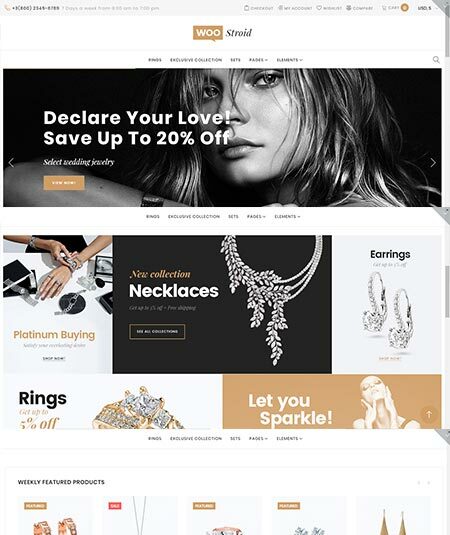 It is a unique and modern WordPress theme with premium WooCommerce support. That means it will provide you with the opportunity to sell your property through the internet. 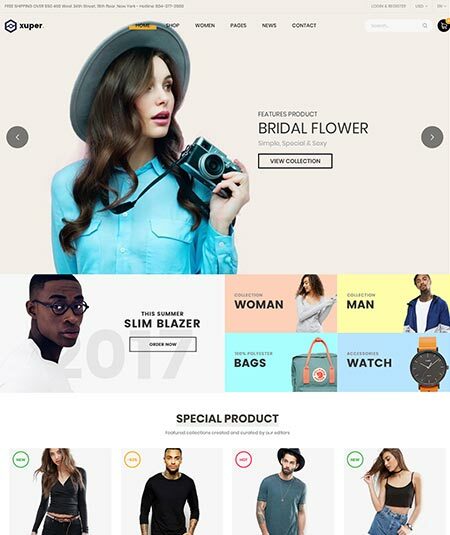 To use as an online digital store, hi-tech store, watch store, clothing store, furniture, and bookstore etc., you can use this theme. This theme is in fact powered by UIX theme. Sober is designed with the mobile optimization and responsiveness. So you can even handle your theme with your smartphone. You are also allowed to create anything with the powerful drag and drop page builders. If you have a wish to have your own portfolio page, you are then welcome. You can also showcase your works on it with the grid style. It is also SEO optimized. So all its features are enough to impress you. Now it’s a supermarket online WordPress theme. It is Oswad. Oswad is a fully responsive and authentic WordPress theme. Then let’s meet Oswad in detail. Osward is for multi-purpose use with the mega menu option. It is also 100% bbPress compatible with full design integration. RLT that means Right to Left layout is also available here. 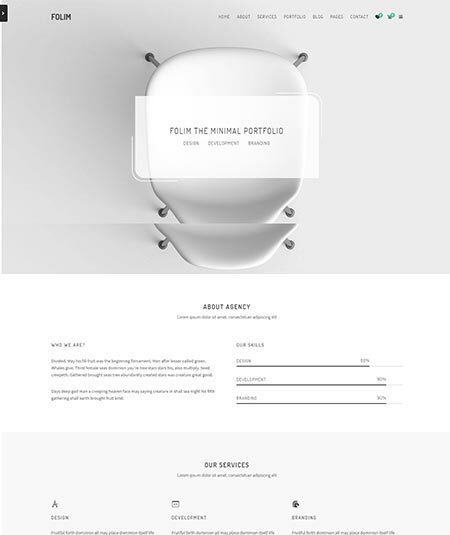 To have your own portfolio page you can get the option here. So you can easily showcase your work in that way. The WooCommerce compatibility will again let you sell your products online. With 30 shortcodes, 600 fonts and unlimited color options, you can customize your theme as you want to. So how you fell about it? Do you think it can be a perfect one? If so then why are you late? Just get it soon. Wanna get a Supermarket WordPress woocommerce-themes? Have a glance at Woomarket. 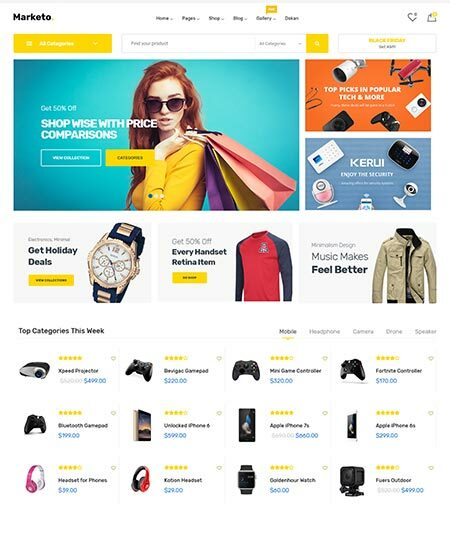 It is a fully responsive theme which is good as multi-store. Let’s meet it’s amazing features. Woomarket is as usual WooCommerce compatible with the wish list plugin. Another marvelous fact is Woomarket is 100% bbPress compatible that will let you have your own forum. Catalog mod, add to a curt button and extensive documentation are available here for your satisfaction. Again it is cloud zoom and child theme ready. With the fully customizable homepage and tons of options, you will get your desirable design theme page. Demo content and portfolio page are always attached to it. I hope you won’t be disappointed with Woomarket. Let’s meet Frido, a fashion-related minimal clean WordPress theme. 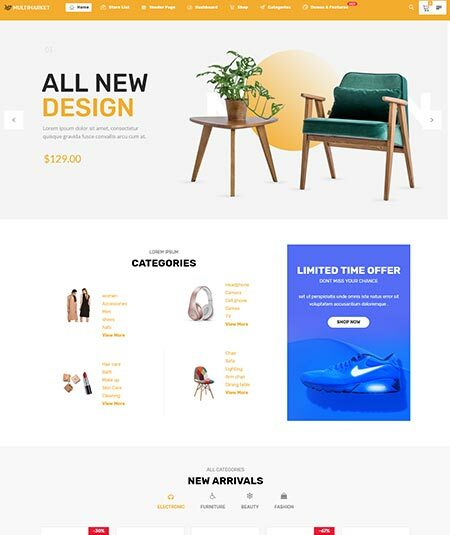 Frido is a great and impressive WooCommerce theme which can be a decent choice for you if you think all its features match your requirements. So let’s check out those features. As I said it before, Frido is a woocommerce supported theme. So it will be very easy for you to be benefited by selling products through online markets. This is the reason, it can be a great companion for a businessman. You know? Frido is compatible with almost all the cross browsers. So you can operate this theme with any of your suitable browsers like Firefox, Safari, and Chrome etc. Even with its full responsiveness, you can run it via smartphone. Frido is built on Elementor page builders for WordPress. So don’t worry about its performance. Besides tons of its other features will make you so happy with it. So I don’t think you have any probability to regret with it. It’s again another woocommerce supported theme. Actually, for the type of business purposes, woocommerce is quite a compulsory and demandable option. However, come and meet Vitrine, a modern and modest WordPress theme. Being a woocommerce supported theme, Vitrine will always let you sell your products online. Vitrine is also a fully responsive and mobile friendly WordPress theme. Its cross browsers capability will again let you operate the theme with the browser of your choice. It is also ready with being highly customized alongside of high resolution. Again it is SEO optimized. Are you a beginner? No problem. Vitrine needs no required experience like most other popular themes. It has lots of demo videos of instructions. So within a minute, you will be capable of handling it. You see the features of Vitrine? Ain’t they okay? I think that’s all you will be in need of a good business. What about a multivendor woocommerce-themes? Are you interested? Then for you, I am presenting Marketo, a super-fast, multivendor WordPress-themes with thousands of amazing features. Let’s check them out. Marketo is built with Elementor page builders with the super-fast scrolling system. Again it is very easy to use and install. It will let you use it from the beginning with the help of its clear demo instructions. I have already said about the WooCommerce compatibility of Marketo. Yes, for this reason, you will be able to sell your products through the online markets. Again Marketo it fully responsive and mobile friendly. Marketo is also compatible with almost all the cross browsers like Firefox, Safari, Chrome etc. So you can run it through any one of your choices. Then what’s more you need? I think you won’t find any lacking if you get the details of it. Let’s meet Cocoon, an amazing WooCommerce WordPress-themes. It is modern and fully responsive. I am pretty sure that all its features will, of course, mesmerize you. So don’t be late, just meet those amazing features first. Cocoon is, as usual, a WooCommerce compatible WordPress theme. So you don’t have to be worried about the way to sell your goods through an online shop. It is again totally mobile friendly and good to see. It is also SEO optimized. So don’t think much on your themes visibility. It is also well documented and cross browsers compatible. So you can operate this theme with any browser of your choice. It’s not the end. It has also numerous breathtaking features like one-click demo, easy installation, lifetime update, social media icons etc. If you think all are good enough for you, don’t think more. Go ahead with Cocoon and be succeeded. 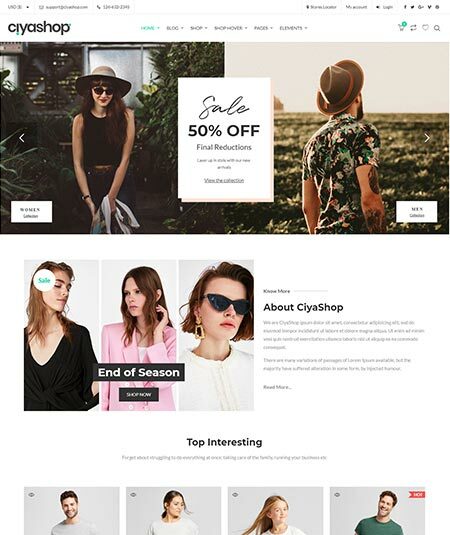 CiyaShop is an excellent multipurpose WordPress theme. I’m not calling it excellent for anything. It has all the reasons to be so. If you think it as an option, then let’s check what great features are waiting for you. 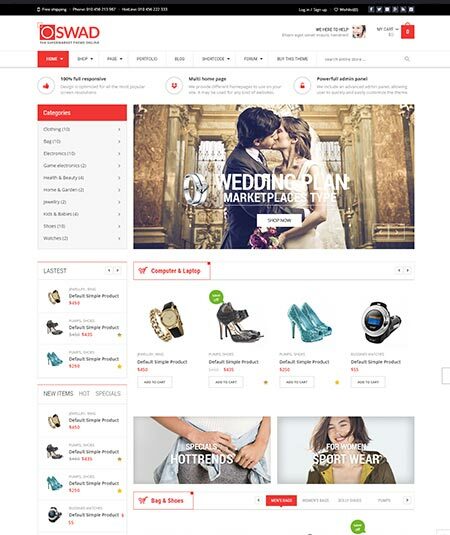 CiyaShop is a very exclusive WordPress theme with about 50 eCommerce site. Your customers will easily give feedbacks and reviews on it. Besides they get is very easy and quick to pay a visit and buy through it. It’s again about those two most important facts, SEO optimization, and WooCommerce compatibility. Woocommerce will let you sell through online. And SEO will watch over the themes ranking and visitor’s number. CiyaShop is built with the powerful drag and drop page builders. It is again fully responsive and mobile friendly. To customize your theme, you will get lots of options too. So do you agree with me to call it an excellent WordPress theme? I hope you will. Now it is Famita, an exclusive WooCommerce WordPress theme with minimalist design. Famita is great to use an online store of any category like fashion store, furniture store etc. Okay, then let’s see what it will offer. Famita is a wonderful WordPress theme that is very easy to use, install and update. You can even run it within a minute of installation even if you are a beginner. WooCommerce compatibility and SEO optimization are the two most important services. You have to have these two while running a successful online business. Famita belongs both of them. So you want more? Yes, there are more, many more. While running Famita you will be able to use it via smartphone with the browser of your choice. Because Famita is entirely responsive and cross browsers capable. Now I hope you will have no question further. Let’s meet Supro and say wow! 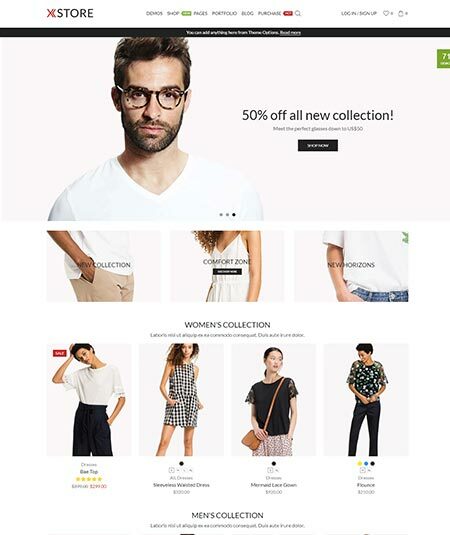 Supro is an amazing minimalist AJAX woocommerce-themes. It is very good to use as an online shop or shopping center. So how about learning more about Supro? Let’s see what it will offer. Supro has WooCommerce compatibility. So I think you have already get the idea about what facilities you are being offered. Yes, you can sell your products easily by using this theme as it has this amazing service. Next, it is SEO optimization. SEO will help you by bringing more visitors while watching over the page’s ranking. Besides, you will get some other special facilities of having cart system, wish list, filter option etc. You probably don’t know how easy it is to operate this theme. You will get enough demo instructions and easy to install system. So what else do you need? I think there is nothing left. So just grab it as you wish to. Didn’t you say wow yet? Meet Oxygen, a world-class, clean and dynamic WordPress theme. Oxygen has a very good reputation as a theme especially useful for the online shop. If you need such WordPress theme, you have to look over its amazing features. Let’s do it. As usual, Oxygen has WooCommerce compatibility. So to sell your products via online will be no tougher fact. You will have the hidden curt on the top that will let you know about the products in the curt. SEO optimization will help you by bringing lots of visitors as well as maintain your page’s ranking. So the doubt on visitors’ number is finished here. Oxygen also provides facilities for having wish list, quick installation and tons of amazing features. Lastly, I should mention a set of some essential features like cross browsers capabilities, easy to use and responsiveness. You can so use this theme via your smartphone through the browser of your choice. So I hope you have already got it about why Oxygen should be recommended. Let’s meet 5th Avenue, a modest and clean WordPress theme. 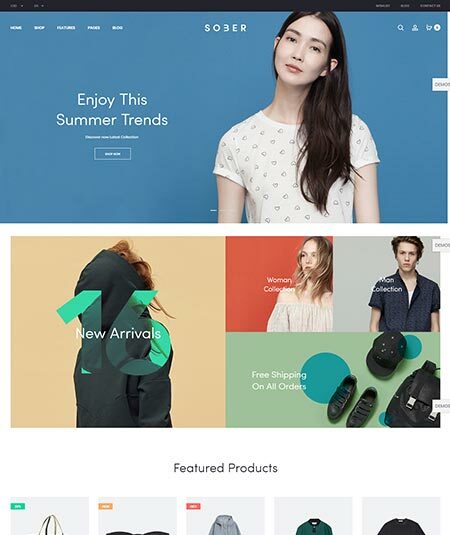 It is very good to use for fashion and lifestyle-related theme. So just glance over its fascinating features and be sure whether or not you can make it your trusted companion. I hope you have already known about the WooCommerce support. To sell your products online, you will need this facility. And 5th Avenue will provide that. So you can build your great store through it. To make it a store, you have to showcase your products here. For that, you will a huge number of options. You can arrange those goods in a horizontal or vertical grid with quick zooming system. Add to cart option is also added here. You can also have a good portfolios page to express yourself. Color setting option with tons of fonts will let you decorate your theme pas as your wish. So what’s more you are needed? Its good, isn’t? Yes, it’s impressive and amazing. If your intention is to find a fashion related responsive WordPress theme, you can then meet Stylista. It is a fully responsive and WooCommerce compatible WordPress theme. Let’s check out what it will provide. As I have said it earlier, Stylista has WooCommerce compatibility. It means you are allowed to sell your products online. Besides, its full form responsiveness will let you operate it via smartphone. With the help of one click demo support, you can operate the just within a minute after import. Its again very easy to use, install and update with a lifetime free update facilities. You know what is SEO optimization? Yes, Stylista is SEO optimized that means it will always look after the pages ranking. I guess you are already impressed. Don’t think it’s all. Stylista has tons of further facilities that are also breathtaking. Xuper comes with being an ultra-powerful and clean wordpress them. 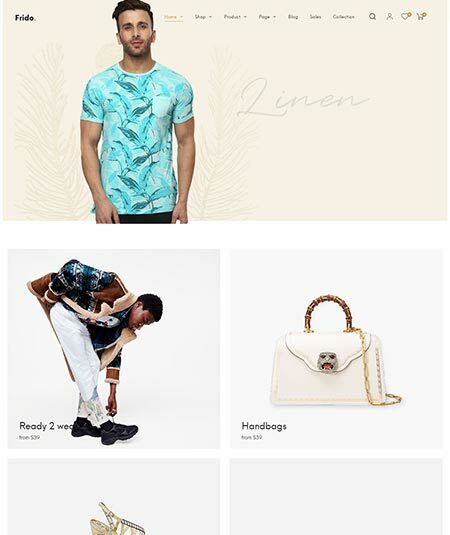 This theme is a good fit for any type of fashion related websites. Xuper embodies a stylish design with a product-centered layout to take every customer’s breath. Let’s see what it will offer. WooCommerce compatibility of Xuper will let you sell your goods that you will offer to your customers. So you don’t need to worry about this fact. Just stay calm and watch over its other mesmerizing features. If you start to use Xuper, you will be surprised to know that it needs no required code. Even if you are a beginner, it will be the same for you. It has also one click demo installation and enough demo instructions. Xuper is also compatible with almost all the cross browsers. It is 100% responsive and mobile friendly too. It has the social media icons and lifetime free update facilities. So what’s up? Do you decide to grab it? If so, don’t be late, just go ahead. 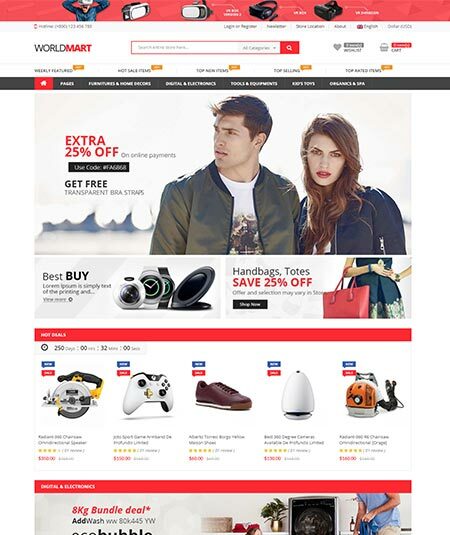 Let’s meet Worldmart, an amazing, dynamic WooCommerce supported WordPress theme. 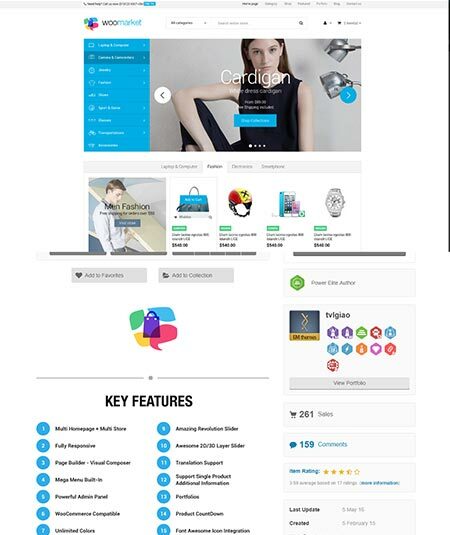 If you are looking for such kinds of WordPress theme, you can pay your attention to WorldMart. So let’s check the features of Worldmart out. As I mentioned it before, Worldmart is WooCommerce compatible. So it won’t be a fact to create any pressure to sell your products through online markets. It is also fully responsive and mobile friendly. Worldmart is compatible with almost all the cross browsers like Firefox, Safari, Chrome, Opera etc. It has the social media icons so that you can share your advertisement and post through them. Again Worldmart is SEO and speed optimized. So don’t worry about your website’s ranking. Worldmart has also the mega menu and easy installation support. So what is an opinion on Worldmart? I hope it is, of course, something positive. If you are looking for a grand and totally amusing WordPress theme, then I think you near to your desirable one. So let’s meet Philos, a responsive and easy to use WordPress theme. It is a perfect fit for use as fashion related websites. As usual, Philos is very easy to use, install and update. It offers you a powerful admin panel. Unlimited color options, grids, and fonts are also available here. So you can customize your theme following your choice. 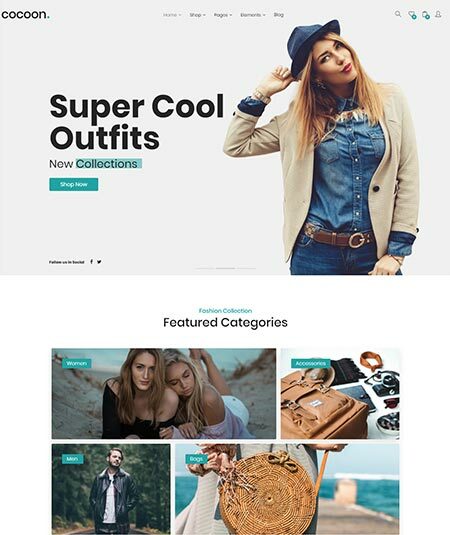 It is a WooCommerce compatible WordPress theme. So you can use it as a great source of income by selling your products like another renowned online store. Again it is fully responsive and mobile friendly. Lastly, I would like to talk about the SEO optimization of this amazing theme. Being SEO optimized, Philos will always look after your pages ranking while seeking the attention of the customers. So I hope you have already get the point why it should have a special recommendation. Come and say hello to Minera. 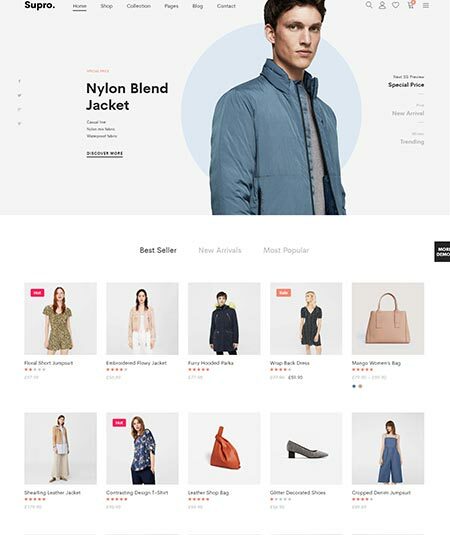 Minera is actually a superb WooCommerce and minimalist WordPress theme. It is very suitable to use as an online shop for clothing, shoes, cosmetics and other accessories etc. So we should first find out about the facilities, we ate offered by Minera. Minera will provide us with the most essential SEO service. It will help us have more and more visitors. Again the WooCommerce compatibility will let us sell products online. So it can a great source of income. If you start using this theme it will let you customize it with your own wish. For that, you will get lots of color options, typography, grids, and fonts. It is again entirely responsive and mobile friendly. Furthermore, Minera will let you use any browser of your choice as it is cross browsers compatible. It also has the social media icons. So I think all your demands are already fulfilled by Minera. For further information, browse on it. If you are in search of a powerful multipurpose WordPress theme, hopefully, you are seemed to find it here. So let’s get introduced with Woostroid. It is a dynamic and clean WordPress theme with tons of useful and amazing features. Are you thinking about the WooCommerce compatibility? Don’t worry. It is Woostroid. Of course, it is WooCommerce compatible. So don’t think much about your profit by selling online products. Again Woostroid is entirely responsive and you can run it with any of your devices even with your smartphone. It is also SEO optimized. So your tension on the visitors’ attention should be diminished. Besides powerful drag and drop page builder is used to prepare this theme. What’s more, you want to have? You will get many more. For customization, you have options and admin panel. Their customer service is also very good. So I don’t think you will have to regret having it. 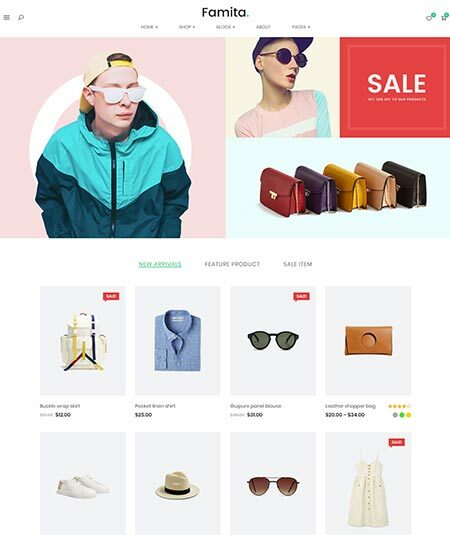 Meet Styler, an authentic and classic WooCommerce WordPress theme. For any type of fashion related websites, you can take Styler as a very good option. But before grabbing any website, the basic is learn clearly about its features. Let’s do that. As you saw it before, Styler is a WooCommerce supported WordPress theme. So don’t worry about selling your products through online markets. WooCommerce will handle it for you. Styler is a fully responsive and mobile friendly WordPress theme. So it allows you to use your laptop, desktop, tablets and even your smartphone to operate it. Even if you are not a beginner, don’t worry. It has a sample demo installer and sufficient instructions. As Styler is cross browsers compatible, you can run it using any browser of your choice. It also allows you to share your post and advertisements through the social media. Besides, you will get other tons of facilities. So I hope your journey with Slyler to be successful will be pleasant. It’s a WordPress theme for kids. 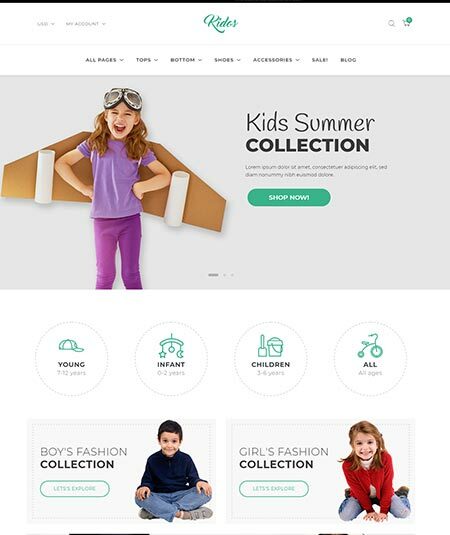 So let’s meet Kidos, a kid’s fashion related WooCommerce supported WordPress theme. To be used as an online store for kids clothing and accessories, Kidos can be the perfect one. Let’s see what it offers. Yes, WooCommerce is also supported here. Just calm and sell your products and goods, you offer to the customers through your online store. Again Kidos is very clean and easy to use type theme. Kidos is mainly an eCommerce theme that aims to fulfill all the expectations of the kids. While using Kidos, you can showcase those products easily. You can get the customers review and feedback too. Kidos is Compatible with Elementor, King Composer and Visual Composer. So you must get the idea about how powerful it is. Again I am pretty sure that its other features will blow your mind. So must go, grab it if you think it’s good. Now it is time to meet a WordPress theme related to sport, nutrition, and lifestyle. So say hello to Certionix. It is a sports-related WooCommerce WordPress theme with amazing features and functions. Let’s meet those in a brief description. It is a fully responsive and retina ready WordPress theme. So you can operate it even with your smartphone. It also has unlimited color options and typography so that you can customize your theme by yourself. As it is WooCommerce compatible, it will make you rich by allowing you to sell online products. For this, you have to gather enough products. You also have to showcase theme finely. For this, all types of options are available here. Furthermore, to share your advertisement and posts, you can use the social media icons too. It is also cross browsers compatible. So just go for it with any browser of your choice. These are not all. You will find many other facilities while using it. So just go for it. Again it’s a sports-related WordPress theme as the name says. It is Sportlabs. 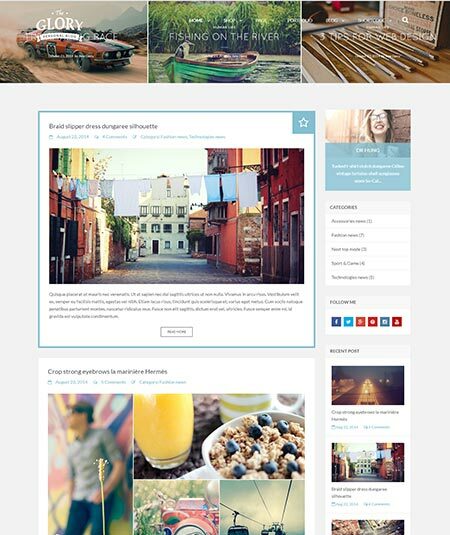 It is very a clean, moderated and decent WordPress theme with amazing features. Wanna meet them? Let’s do so. Sportlabs is very good to use as a sporting goods website. As it has the WooCommerce compatibility you can sell your thoughts and goods through it. It is again fully responsive and you can use it through your smartphone. As a great WordPress theme, Sportlabs will let you edit and customize your theme by yourself. You can choose from unlimited options and typography. The necessary social media icons are also available here. Furthermore, it is cross browsers compatible. So with any popular browsers like Firefox, Safari, Chrome, Opera etc., you can use it. Robs of other features also wait for you with Sportslab. Just go ahead with if you think it is good for you. Are you looking for a multipurpose WordPress theme? If so, you can pay your attention to Neto. 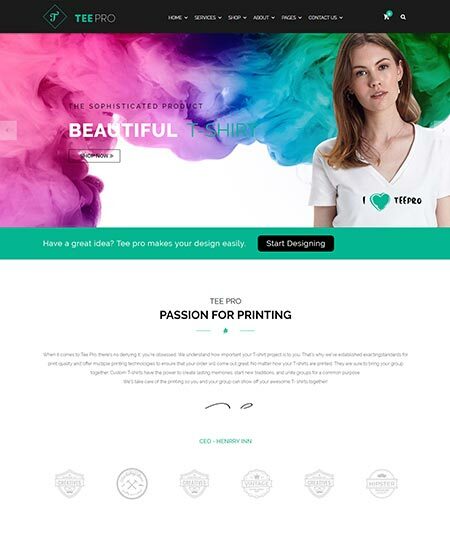 Neto is an amazing minimalist WordPress theme and very to use as a t-shirt eCommerce WordPress theme. Then see what it will offer. Are you not an English speaker and so want to have a theme of your native language? Don’t worry. Neto is RTL that means Right to left language ready. Again it is entirely responsive. So you can operate this theme even with your smartphone. Neto is a cross browsers compatible WordPress theme. So it doesn’t matter what type of browser you are using to run this theme. Besides, it includes all the social media icons. Furthermore, Neto will also provide the facilities of sample video instructions and one-click demo. So I think it is pretty good for you and the left is completely upon your choice. Let’s meet XStore, a classic and trustworthy WordPress. 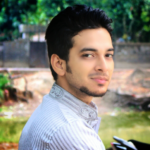 Do you know why I am calling it a trustworthy WordPress theme? I do it because it has about 30 thousands pleasant users. So you should judge it after checking its features. 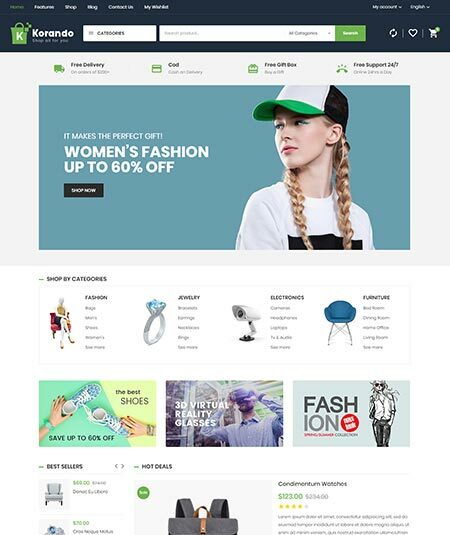 As a great WordPress theme, XStore is WooCommerce compatible. So it won’t be a problem to sell your goods through the internet. This is why it would be a great source of income. 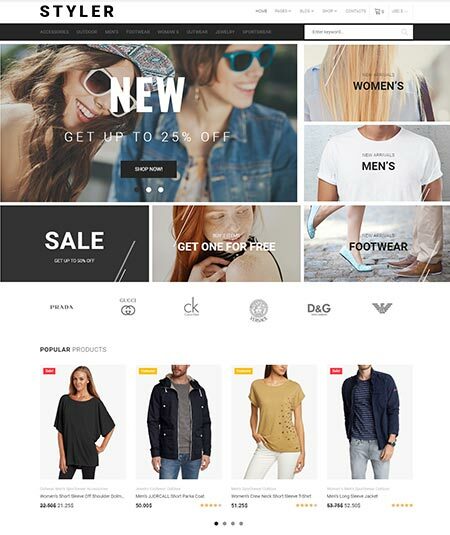 XStore is again a fully responsive theme. It is also RTL and retina ready. As a great feature of an amazing WordPress theme, WooCommerce is available for XStore. This service will so take care of your business. Because it will let you sell your products online. If you want to share your website’s post through some social media, you can do that. Because it has all the necessary social media icons and it is also compatible with the cross browsers. So there should be no confusion on the greatness of XStore. 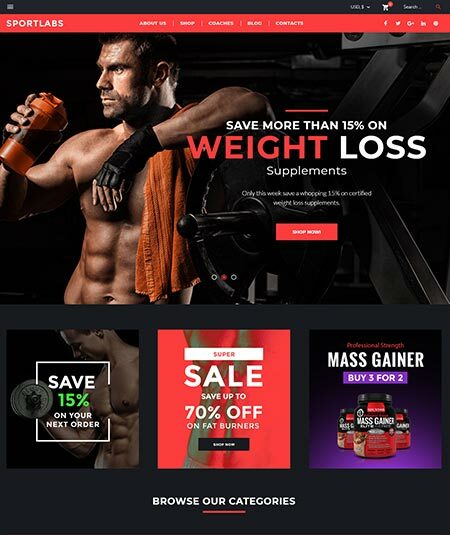 If your intention is established an online shop for mobile, computer, high tech etc., Fitshop is here for you. It is an amazing and dynamic WordPress theme with thousands of stunning features. Let find them out. 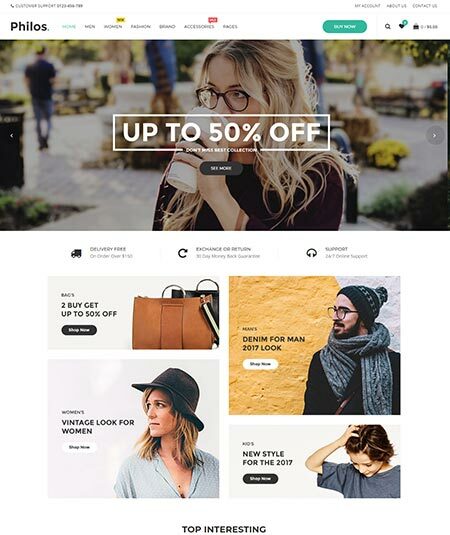 It is a WooCommerce compatible WordPress theme. So it will take the responsibility to make your profits. Because it makes the way to sell your products online. Besides, it is entirely responsive and mobile friendly. 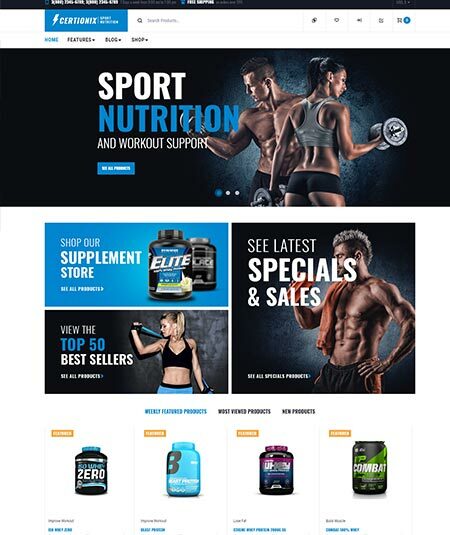 Fitshop includes the visual composer page builders and it is also SEO optimized. So you can be sure about the visitor numbers and it will take a good care of the page ranking. This amazing WordPress theme also includes new integrated mega menu support and easy installation system. So what you think about it? For me, it is good enough to make you satisfied. Say hello to Korando. It is actually a clean, moderated and decent WordPress theme for multiple purposes. If you are planning to have such a cool WordPress theme, you can then check out about what exclusive facilities, Korando offers. Let’s do it. Korando is fully responsive and mobile friendly WordPress theme. So you don’t have to have an expensive and powerful device to operate it. You can just go through your smartphone. Again it has impressive layouts and widgets. It is also WooCommerce compatible. So it helps you to sell your products online. So it will be a great opportunity for you to run a successful business. However, Korando includes the social media icons so that you can share your post through them. Korando is actually very suitable to use as a fashion or furniture store. It is powered by Redux framework. It also includes lots of samples data and Mailchimp service. You can also search it to get more information about it. It has no reason to dissatisfy you. Are you ready to say wow? I am presently a world-class, amazing and modest WordPress theme, Turan. It is actually a multipurpose and responsive WordPress theme. Before saying wow, let’s come to know what facilities Turan will provide you. 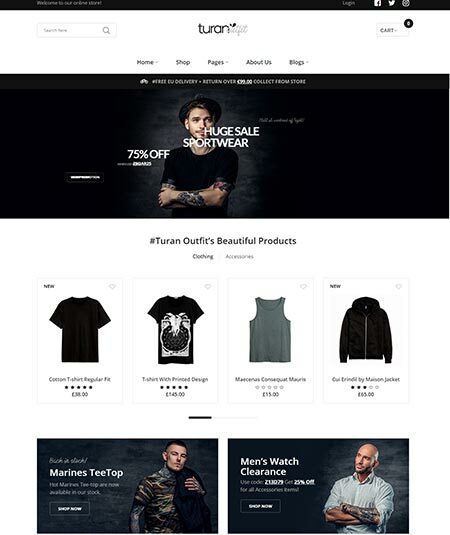 As a world-class business related WordPress theme, Turan is as usually compatible with WooCommerce. So you don’t need to worry about the sale of your online shop. Just gather your products with a very good quality and showcase theme through Turan. Turan is also SEO and Speed optimized. So it will handle the number of the visitors and their satisfaction with hi-speed system. The customer will also enjoy the amazing shop features like add to curt, remove from curt, reviews, comment etc. A powerful admin panel is here to provide lots of options for you. You can again customize your shop as your wish. Besides it is cross browsers compatible with the social media icons. So I think you are already impressed to say wow. Folim is a clean and comfortable WordPress theme for business and fashion related websites. 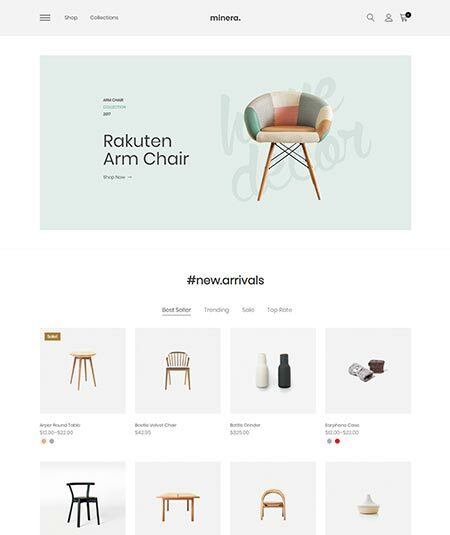 It is a minimalist WooCommerce WordPress theme. It is well enough to impress you and its amazing features will, of course, do so. One of the most important facts of a great WordPress theme is the SEO optimization. Folim is such an amazing theme. Again it is built with WPbekary page builders. So you must be known about how powerful it is. As usual, Folim is WooCommerce compatible. So keep your tension about the sale of your products through online. However, it is fully responsive and mobile friendly. So if you don’t have any powerful device, just go for it through your smartphone. Folim has also the social media icons and crosses browsers compatibility. So don’t worry about the fact of your browsing medium. I also have to ask you to browse more about Folim as it has many more breathtaking features. This is why I will recommend it. These all are responsive themes ? All are fully responsive and SEO Optimized WordPress themes.